Several derived sand dollar (Echinoidea: Clypeasteroida) families are characterized by the presence of Gregory’s diverticulum, an accessory organ of the digestive tract. This soft tissue structure is composed of a central tubular cecum that gives off multiple lobes into the periphery of the test. Most notable are the organ’s capacity to selectively store sand grains that the animal has taken up from the surrounding sediment as well as the gradual reduction of Gregory’s diverticulum during ontogeny. Several aspects of the biology of this structure have remained unexplored, including the organ’s precise morphology and structural diversity. 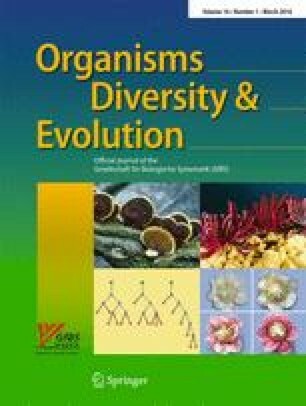 In order to provide a concise basis for future histological, physiological, and functional analyses, a comprehensive comparative morphological and phylogenetic study across numerous taxa was undertaken. Taxon sampling comprised over 100 clypeasteroid species, including various fossil taxa. This extensive dataset permits establishing a concise terminology that incorporates all of the organ’s substructures. In addition, three-dimensional models of Gregory’s diverticulum are presented that provide an improved spatial understanding of the organ’s morphology in situ. The combined data from dissection, X-ray imaging, microcomputed tomography, and magnetic resonance imaging reveal a previously unknown variability of the structure, which also yields several phylogenetically informative morphological characters. Among those sand dollar families that possess Gregory’s diverticulum, the organ is present in two distinct shapes, which can be distinguished by the number, shape, and location of substructures. In addition, the data provide unequivocal evidence that Gregory’s diverticulum is absent in the extant taxa Rotulidae and Astriclypeidae, but also in the enigmatic Marginoproctus. The online version of this article (doi: 10.1007/s13127-015-0231-9) contains supplementary material, which is available to authorized users. We would like to thank the following colleagues for providing access to museum specimens: Nadia Améziane (MNHN), Andrew Cabrinovic (BMNH), Jean DeMouthe (CASG), Mariko Kondo (MMBS), Kwen-Shen Lee (NMNS), Carsten Lüter (ZMB), Kelly Markello (CASIZ), Jørgen Olesen (ZMK), David L. Pawson (USNM), Chrissy Piotrowski (CASIZ), Bernhard Ruthensteiner (ZSM), Andreas Schmidt-Rhaesa (ZMH), and Robert M. Woollacott (MCZ). We are grateful to Felix Beckmann, Johannes Müller (ZMB), Nina Nagelmann, and Malte Ogurreck for their kind help with imaging equipment. Adam Baldinger (MCZ), Tom Schiøtte (ZMK), and Berit M. Ullrich provided valuable assistance with specimen handling and shipment. Constructive comments and suggestions by Andreas Kroh and one anonymous reviewer helped to improve the text. We are furthermore indebted to Gonzalo Giribet (MCZ) and Andreas Ziegler for facilitating access to scanning systems. Fox, R. (2001). Mellita quinquiesperforata—sand dollar. Invertebrate Anatomy OnLine, http://lanwebs.lander.edu/faculty/rsfox/invertebrates/mellita.html. Accessed 4 Aug 2015. Kroh, A., Mooi, R. (2015). The World Echinoidea Database. http://www.marinespecies.org/Echinoidea/. Accessed 4 Aug 2015. Zachos, L.G. (2006). Encope michelini, five-notched sand dollar. Digital Morphology, http://digimorph.org/specimens/Encope_michelini/NPL4110/. Accessed 4 Aug 2015. Ziegler, A., Faber, C., Mueller, S., Nagelmann, N., Schröder, L. (2014b). MRI scans of whole sea urchin specimens. GigaDB, doi: 10.5524/100124. Accessed 4 Aug 2015. Ziegler, A., Lenihan, J., Zachos, L.G., Faber, C., Mooi, R. (2015). Comparative morphology and phylogenetic significance of Gregory’s diverticulum in sand dollars (Echinoidea: Clypeasteroida). MorphoBank, Project #2202, doi: 10.7934/P2202. Accessed 4 Aug 2015.